We’d love your help. Let us know what’s wrong with this preview of The Three Kitties That Saved My Life by Mike Meyer. "This is like drinking tea and honey on a cold day." When tragedy struck, I thought for sure that my own life was at an end. I was wrong. This is the true story of how two stray rescue cats and a woman named Kitty, whom I finally met a "This is like drinking tea and honey on a cold day." When tragedy struck, I thought for sure that my own life was at an end. I was wrong. This is the true story of how two stray rescue cats and a woman named Kitty, whom I finally met after a wild ride of internet dating, brought love, romance, and laughter back into my life. To ask other readers questions about The Three Kitties That Saved My Life, please sign up. This well-written memoir starts out with the author losing his beloved wife to leukemia. His grief seems unsurmountable. Even though friends and relatives try to console him, he withdraws from the world, with only the companionship of his old cat. When the cat also dies, the author’s depression gets worse. Then, when the healing process is ever so slow and there is still no light on the horizon, a stray kitten enters the author’s life. No, he doesn’t want it. Pets die. He has lost pets before. A This well-written memoir starts out with the author losing his beloved wife to leukemia. His grief seems unsurmountable. Even though friends and relatives try to console him, he withdraws from the world, with only the companionship of his old cat. When the cat also dies, the author’s depression gets worse. Then, when the healing process is ever so slow and there is still no light on the horizon, a stray kitten enters the author’s life. No, he doesn’t want it. Pets die. He has lost pets before. And now with the grief for his wife he still can’t deal with and the loss of the old cat, he really doesn’t want another living being to get attached to and, then, at some time, lose again. Yet he is the only chance for this poor kitten. If he doesn’t take it, it will go to the shelter, where it will end up euthanized. The author is a compassionate human being, and he loves animals, and—even though he doesn’t realize this yet—he needs this kitten as much as it needs him. You guessed right. He takes the kitten home. And what no grief counselor has been able to accomplish, the kitten does. The kitten, named Coco, is so lively that his human rarely has any time left to be lost in gloomy thoughts. It probably takes a cat lover (which I am) to fully appreciate the descriptions of this little cat’s play and games. With all this enjoyable action, it doesn’t take long until the author finally has his life back. Well, not quite. As wonderful as the relationship is between man and cat, it is the love of a woman that the author still misses. It has been a few years that his wife has been dead, so it is not too early to look for female, human companionship. Few people ever find their soul mate. How are the chances to find a second soul mate when you have already found and lost one? Well, you can’t tell unless you try. So the author starts dating. It doesn’t go too well. Yet as you might guess from the book cover, the author finally falls in love again. And his new love’s name is Kitty. So here you have the second kitty. Now where is the third? Coco is an extremely active kitten who doesn’t slow down when he reaches adulthood. Coco is also a strictly indoor cat. So even with lots of toys and the author and his new wife both cat lovers and willing to make their “little boy” happy, they find themselves unable to physically keep up with the overactive cat, whose favorite game it is to get chased up the stairs. Let’s not forget: The author and his new wife are no longer spring chickens; they are around age sixty. The only solution is a feline playmate for Coco. So here comes your third kitty. I won’t tell you any more. If you like to read a very moving and eventually uplifting story about grief, love, and cats, this book is for you. P.S. All main characters in this book, two-legged, three-legged, or four-legged, are not only likable but adorable. You’ll fall in love with them all. I knew this was not a fiction book from the get go. What I did not know is how it would touch me. The author loses his spouse to a rare fatal form of cancer and has to start over again with his life. This time as a widower. His idea of starting over is by becoming a hermit but one day a kitten changes all that and this process brought me almost to tears. By the time he meets the second Kitten, a woman and his soul mate named Kitty his life changes for the better one more time. The three of them become a family. Him, Kitty and Coco the lively cat. But Coco is lonesome so they add one more addition to their family - Pom Pom. All is however not rose petals and dew drops as Pom Pom gets diagnosed with cancer. But after a leg amputation Pom Pom shows a new strength. He finds ways to do what he wants with three legs and not four. But through it all he shows love and joy for the chance of life. The authors aptly named this book The Three Kitties That Saved My Life, but I think with this book and his honesty about his emotions he is saving others. I can't imagine how much guts it would take for a 59 year old person to rejoin the dating game. And although the author does not jump into this new world with a Hee ha approach he does not give up on it either. It is seldom that a true life story really fills me with admiration for the person. This book is the exception. A 7 * read if I could do that. What can I say. I was told about this book some time back by a friend who read it and loved it. So when the opportunity presented itself I could not wait to get a copy. Then I started wondering...what if I don't like it? Then what. So slowly I started reading it. Well I started off slowly. Then I got caught up in the story. Falling in love with Coco and his brother. The author and his ability to -- with out hyperbole or extensive angst tell us his story of loss, helplessness and in the end hope What can I say. I was told about this book some time back by a friend who read it and loved it. So when the opportunity presented itself I could not wait to get a copy. Then I started wondering...what if I don't like it? Then what. So slowly I started reading it. Well I started off slowly. Then I got caught up in the story. Falling in love with Coco and his brother. The author and his ability to -- with out hyperbole or extensive angst tell us his story of loss, helplessness and in the end hope and love. I fell in love with this book. I am sure you will as well. By the time I got to 5% in this book on my Kindle, I was already bawling my eyes out. Seriously, I had to put it down every two minutes or so to wipe the tears from my eyes first before I could continue reading. In only a few paragraphs, the author managed to describe his first wife in such a sincere way, it felt to me as though I’ve known her personally. His loss was palpable and felt like my own. My heart broke for him, not only for losing his life partner to cancer, but also for all the tryin By the time I got to 5% in this book on my Kindle, I was already bawling my eyes out. Seriously, I had to put it down every two minutes or so to wipe the tears from my eyes first before I could continue reading. In only a few paragraphs, the author managed to describe his first wife in such a sincere way, it felt to me as though I’ve known her personally. His loss was palpable and felt like my own. My heart broke for him, not only for losing his life partner to cancer, but also for all the trying times he had to endure together with her as she battled with this incurable, unforgiving illness. Although at the start this is an achingly heartbreaking story about loss, grief, starting over and moving on, it is also filled with many humorous laugh out loud moments; and at its core, it is a poignant tale about healing and finding “the one”. I adore cats and was delighted to read the chapters on the author’s days spent with his cat, Coco! It made me miss my own cat that had passed away many years ago. Every cat-lover should read this book though. It is so magnificently spot-on with all the kitty mannerisms and typical feline traits; I couldn’t stop smiling as I recognized this same behavior in my own cats. Coco and Pom Pom’s different and adorable personalities jumped off the page and made me want to cuddle them and play all their favorite games with them. The one thing Coco did that practically had me rolling on the floor with laughter was when he was playing with the bathroom cabinet doors in the middle of the night. The little guy was having a grand ol’ time and I just couldn’t stop laughing while envisioning this spectacle. And then there are the chapters about the author stepping back into the dating arena again. He described it so well that I was chewing my nails with nervous anticipation as he went through several failed attempts until he finally met “the one”. Let me tell you now: Hollywood couldn’t have written a better or more moving romance even if they tried. I have read novels where the romance nearly brought me to tears with its all encompassing beauty, but not one of those romance novels holds a candle to what these two people have in real life. I couldn’t help but feel the same joy as what they felt while falling in love with each other. The best part of this quick read is that it left me wanting more! This was just such a memorable and personal journey to take with the author. Starting from the minute he met his first wife, losing her to cancer, then having to go through the grieving and healing process, finding and giving Coco a home, working up the courage to open himself again to love and finding a soul mate, and then meeting his second wife, and opening his home to a playmate for Coco; The Three Kitties That Saved My Life is a candid, wholly poignant and heartfelt recounting of one man’s voyage from devastating loss to his unexpected happily ever after. I recommend this extraordinary novella to everyone who has ever had to deal with loss, and also to every cat-lover out there who would undoubtedly enjoy the antics of Coco and Pom Pom, and who would understand that a house can become a home with the addition of four-legged felines. This inspiring novella barreled me through a multitude of emotions and cemented my opinion that cats indeed do have healing powers. As it takes about two hours to read, The Three Kitties That Saved My Life is the perfect anytime read for anyone anywhere! This story is still very heavy in and on my heart... a true story of love lost, and then a new love found. Author Mike Myer has poured his heart and soul out for us as a reader to see that yes, in fact a tragic loss that has left you so devasated where you are so crippled with pain that you feel that there is truy nothing in life to replace the loss that, can infact turn into a place there is light at the end of that dark tunnel. We all have at one time or another have gone through a soul destroyi This story is still very heavy in and on my heart... a true story of love lost, and then a new love found. We all have at one time or another have gone through a soul destroying experience in our lives, but what makes this experience so very different is that Mike has put pen to paper, has written it all down and in turn created this amazing heart breaking novel. Not many of us will do that, sure we may write them down in a journal, or talk to close friends and family. But it takes ALOT to be able to put it in print for the world of readers to see, to experience, to learn from as Mike has done. And for that in it's self makes this novel stand out to me, where others haven't. I cried pretty much all the way through as I was reading it, bringing back so many memories that have been locked inside my heart for so very long. I wish that I could have expressed what I was feeling as Author Mike Myer has done, it may have made things a bit easier to cope with. For that Mr. Myer, I thank you from the bottom of my heart for giving me the opportunity to read, feel, and go through the turmoil that you have.... to see that there is or could be good that comes from such great loss. Many people can take alot from the way this story was told, turn around and apply it to the loss or loses that we have gone through, use this story as a coping tool. Help yourself in any way that you can. I highly recommend this novel as a must read to everyone who may benifit from what is held inside the covers of this novel. Having been there where I've lost a spouse I could really feel for what the author went through. Yes it is much like it was described in the first couple of chapters. It's almost like you died also. It's very difficult and that's to put it mildly. You really don't want to go on with life but you have to because let's face it, life does go on. I personally like what he did to come out of that experience. That was really uplifting. Really great book that will lift your spirits. Even after a major tragedy, life goes on. I love that throughout this whole book you are reminded to look for the positive in life. I have to say I now want another cat! Perfect read if you need to be reminded to look up in life and smile, everything will work out. I honestly did not really read the blurb, I just read the title and figured I would go out of my normal genre and give this a try. Now I like animals, but I am not big on reading about animals. So I was like hmmm what will this book be like. And I was so glad I gave this book a go. I was easily kept into reading the story, my heart broke when he lost his wife and he was in a slump of depression. When he tried the dating scene after so many years and was deceived by people on the internet my heart went out to him. As I know it must be hard for an older man to want to date but can not find that special person. But when he found a friend with Coco and Coco pretty much became a son to him even though he was a cat it was like it was destiny. This author was meant to live life, take care of someone else, and attempt to be happy. But Coco is a very active cat and I found myself laughing at the antics that Coco would put him through. Especially with the cabinets. Then we get to meet Kitty who makes him find human happiness again and how he makes it known by pouring out his heart to her was just the most sweetest thing ever. Kitty and him are just perfect for each other you can tell by the writing in the story being told. You can feel the love radiating off the pages for each other. When they both make a decision to get another cat and named him Pom Pom you get more laughter as Coco and Pom Pom are just the perfect cat brothers. They keep you entertained, and when Kitty and the author get bad news about Pom Pom your heart once again breaks as you hope he can be saved. You honestly do not this author to go through more heartache as he has been through so much and has made it out of the darkness with laughter, love, hope, a will to keep going on. You get so much feelings within this story, that you can not just put it down. You will keep on wanting to read and read to see what other joy and happiness will this author have in his life. There is hope within the story. When the love of his life, Ciba was diagnosed with a deadly form of leukemia and eventually passed away, life seemed too unbearable to live for Michael. Then when his cat of 18 years finally passed, he finally felt really alone and without hope. Getting his haircut at his long time barber, Michael hears the insistent meowing of a cat. It seems the cat was found by the barber’s daughter, and they were going to keep it in a back room until the Humane Society came by. Unable to bear the meowing, Mi When the love of his life, Ciba was diagnosed with a deadly form of leukemia and eventually passed away, life seemed too unbearable to live for Michael. Then when his cat of 18 years finally passed, he finally felt really alone and without hope. Getting his haircut at his long time barber, Michael hears the insistent meowing of a cat. It seems the cat was found by the barber’s daughter, and they were going to keep it in a back room until the Humane Society came by. Unable to bear the meowing, Michael decided to see the cat. Once it was out of the room, it immediately jumped into his lap and fall asleep. Unable to resist, he took the cat home. Michael finally found a new beginning and a purpose in life again…taking care of Coco. Coco’s antics are absolutely hilarious and I could not help but laugh out loud as I was reading. When Michael finally meets Kitty, I was so happy. They seemed to be truly meant for one another and the love that they have for each other is really inspirational. When it was time to get Coco a playmate, the choice was made and the hunt was on to get another cat. The couple went to a local adoption fair, and found a cat that could have been Coco’s twin. It was a no-brainer, and Pom Pom became part of the family. Coco and Pom Pom become the best of friends and provided so much laughter and fun for Michael and Kitty. In the end, all four of them, which had been rescued in one way or another, were now a happy family! Although the journey was long and difficult, Michael learned so much from his three kitties and now considers being the luckiest man on earth. I happened upon a FB promo on this book, and thought it sounded like something I would like to read, and the fact that it was short (137 pages), was a perfect book to read fast. Though I had read the wonderful feedback, I was totaly surprised how much I throughly enjoyed this book. Mike Meyer does a wonderful job hooking us in immediatley, as he describes his wonderful life with his wife, and how everything fell apart when he lost her to Cancer. It was very emotional, as you felt his pain, espec I happened upon a FB promo on this book, and thought it sounded like something I would like to read, and the fact that it was short (137 pages), was a perfect book to read fast. Though I had read the wonderful feedback, I was totaly surprised how much I throughly enjoyed this book. Mike Meyer does a wonderful job hooking us in immediatley, as he describes his wonderful life with his wife, and how everything fell apart when he lost her to Cancer. It was very emotional, as you felt his pain, especially when he closed himself off from anything and everyone. After awhile, he starts living again, though slowly. While at the barber, he is enchanted by a stray cat, whom will be taken to the pound shortly. When the cat jumps on his lap, Mike makes a rash decision to take the cat home. I loved when Mike stopped at Petsmart on the way home to get the cat, now named Coco checked out, and ended up buying everything in the store. Cute. I too fell in love with Coco, as he single handidly brought love back into Mike's life. Coco was a whirlwind, especially discovering his new home, and I adored their new game, Mike chasing Coco. Lots of fun. Coco's antics made him so endearing, and you could see Mike coming back to life. I found myself laughing so many times at Coco. When he decides it was time to open himself to finding a women to share his life, he eventually meets Kitty. It was very heartwarming when Mike realizes that he is falling in love again. Of course, Kitty and Coco get along so well also. Coco turns out to be too much with his constant requests to play his chase game, so Mike and Kitty decide to get another cat. Enter Pom-Pom, who also looks a lot like Coco. It was funny when Pom-Pom tries to ignore Coco, but that doesnt last long, as the chase game begins again with both of them. The family is complete and Mike has his life on track again, though there is a slight tragedy, that puts a damper on things again, but things soon get back on tract. Mike Meyers has taken us on his life changing after the loss of his beloved wife, and how he finds his way back. The stories with the cats was wonderful and so well written. I loved this book. I was recommended this novella by a friend. I am not a big reader of memoirs, or true stories, but this one really touched me. I started this book knowing that it would be heartbreaking at times, but found this story to be very sweet and funny too. The author has had to endure pain that many people have gone through; the loss of a loved one. I have not had to deal with this yet, but it doesn't stop me from empathizing. Michael's heartbreak over the loss of his first wife, Ciba, is palpable and br I was recommended this novella by a friend. I am not a big reader of memoirs, or true stories, but this one really touched me. I started this book knowing that it would be heartbreaking at times, but found this story to be very sweet and funny too. The author has had to endure pain that many people have gone through; the loss of a loved one. I have not had to deal with this yet, but it doesn't stop me from empathizing. Michael's heartbreak over the loss of his first wife, Ciba, is palpable and brought tears to my eyes. The letters he wrote to her are very touching. The antics of Coco reminded me of my own cat, and made me smile because I still miss her even after her death 11 years ago. The introduction of the lovely Kittie, and later Pom Pom, into the family shows that there is hope and love to be found again, even though it may not seem like it at the time. Some people will either find comfort with that, or not. However, I would like to hope that if I ever had to deal with losing a loved one, I would be as emotionally strong as this author. I am very happy for him and his family of 3 kitties, and wish him well. Michael Meyer is an amazing person. He has poured his heart out and shared his grief and love with the world. It is not the easiest thing to do, but I really admire him for it. What would you do if you lost your soulmate, just to happen across another? This story is truly a very uplifting story that captured my heart and soul and held on for dear life. I love to read about Author's real life stories and their fears, and acomplishments. I must say that this is what this author did. He left no stone unturned and poured his soul right into this story. It's so remarkably well written that I just couldn't put it down. It was one of those tear jerking, heart stopping, soul st What would you do if you lost your soulmate, just to happen across another? This story is truly a very uplifting story that captured my heart and soul and held on for dear life. I love to read about Author's real life stories and their fears, and acomplishments. I must say that this is what this author did. He left no stone unturned and poured his soul right into this story. It's so remarkably well written that I just couldn't put it down. It was one of those tear jerking, heart stopping, soul stealing, and mind blowing stories that had me up for several hours into the night. I actually read straight through, that is how intense and addicting this story was. I felt as if I could relate to the author's feelings whether good or bad. The trama that this author went through and yet was able to pull through with a happy ever after was just breathtakingly phenomenal. This story has touch my heart so much that this book is my #1 favorite story of 2014 and a story that I will charish forever. I highly recommend this book to all adult readers from all walks of life and genre. I also DO believe that everyone can find their soulmate and live happy twice in one lifetime. This story is all the proof I need to realise it. I received an e-ARC copy of this book directly from the author in return for an honest review. The author vividly describes what it is like to lose the love of your life. When not long afterwards his cat of 18 years passes away too, Mike is deeply hidden in the grieving process, which is so personal and solitary. Ironically, a stray cat at his barber's makes him a reluctant pet owner again. Coco causes him to realize how much he actually craves human relationships and human touch. We join Mike as he struggles to find freedom to pursue a new love relationship while at the same time being tr The author vividly describes what it is like to lose the love of your life. When not long afterwards his cat of 18 years passes away too, Mike is deeply hidden in the grieving process, which is so personal and solitary. Ironically, a stray cat at his barber's makes him a reluctant pet owner again. Coco causes him to realize how much he actually craves human relationships and human touch. We join Mike as he struggles to find freedom to pursue a new love relationship while at the same time being true to his first love, Ciba. Mike has done a beautiful job in taking us on his journey, drawing the reader into the downs of grieving and the ups of picking up life, including pursuing ánd finding new love with Kitty. I particularly enjoyed how he made Coco come to life by expressing his kitty's thoughts and behavior. Despite the heavy and emotional subject, Mike's story leaves you with hope, and the knowledge that life can truly be more awesome than fiction! "The Three Kitties That Saved My Life" by Mike Meyer is a moving memoir about loss and recovery. Meyer lost his first wife to cancer and gradually recovers from his grief and manages to move on with his life, with the help - you guessed it from the title - two cats and his second wife, named Kitty. This is a selection of short chapters that chronicles the development of Meyer from a bitter widower to a fully functioning and happy man. As an animal lover myself I could not help but love he tales of "The Three Kitties That Saved My Life" by Mike Meyer is a moving memoir about loss and recovery. As an animal lover myself I could not help but love he tales of his relationship with the stray cat that comes into his life just as he needs someone the most - and the same goes for the cat. Charming and much more upbeat so much sooner in the book than I would have expected this has a great feeling to it and is inspiring as well as entertaining. It reminded me much more of dog books such as "Marley and Me" (sorry, I have not read a similar cat book yet) than of cancer / loss/ self help books, but it should fit wonderfully in either category. Having read different books by the same author I am amazed at the versatility of his writing and pleased to see a man so full of life behind those great books of his. This book begins with sadness, detailing Meyer's loss and devastation on losing his wife but soon picks up in a positive way as he grieves and moves forward with his life. Throughout the book his determination to live and love, with the help of two cats (and a Kitty) makes this an enjoyable, positive read. As an animal lover myself I loved the chapters featuring the cats the most, Meyer giving them a voice of their own. Written in the first person gives the reader a connection with the author, an This book begins with sadness, detailing Meyer's loss and devastation on losing his wife but soon picks up in a positive way as he grieves and moves forward with his life. Throughout the book his determination to live and love, with the help of two cats (and a Kitty) makes this an enjoyable, positive read. As an animal lover myself I loved the chapters featuring the cats the most, Meyer giving them a voice of their own. Written in the first person gives the reader a connection with the author, an empathy with his plight, and I found myself sharing his angst and worries about his forays into dating and the reactions of his family and friends to his whirlwind romance. Ok. So this book came as such a surprise. I know what I loved most is this---the authors obvious respect for his late wife and his wife Kitty. Nowhere does he go into a long discourse regarding what they looklike, apart from a beautiful smile. You wontfind them described or discussed in detail! The respect this author shows in not exploiting his significant others truly touched me. I loved following Mike on his journey. Although sad at the start as we see Mike losing his wife. We follow him on his journey of living again and finding love first with a cat and then finally with another lady. This was a fantastically refreshing read, in that it was wonderful to read from a male's perspective of losing a cherished loved one and their road back to living life instead of simply existing. As a real cat lover I expected this book to have lots of things about cats, and I was not at all disappointed by it. The start of the story if very sad, in a double way and the end has also some not so nice part in it, but all in all it's a great survival story about how to handle great losses in your life and accept them in a way that you can get over them and make a new start. Would recommend this book to any cat lover and anybody that had some loved one that passed away. 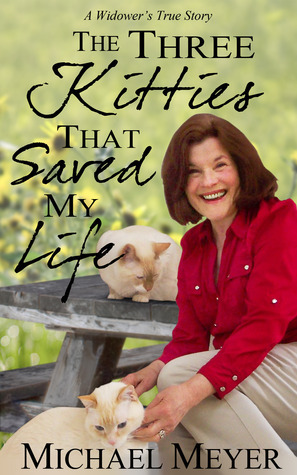 “The Three Kitties That Saved My Life” is a beautifully written memoir of love and loss and love again. I highly recommend it for those who need a lift in their lives and particularly for those who love cats. Mike Meyer pens a tender tale of love, loss, and renewal. Read full review in the 2013 September issue of InD’tale Magazine. The author is enjoying a truly wonderful marriage to Ciba, when she is diagnosed with Acute Myeloid Leukaemia, and his world is shattered with her passing. He finds it difficult to overcome his grief until a little cat called Coco enters his life. They form an immediate bond that lifts him out of his depression and opens him to the possibility of loving again. Kitty enters his life and he finds another soulmate. The third kitty is called PomPOm and completes this little family. I was immediately The author is enjoying a truly wonderful marriage to Ciba, when she is diagnosed with Acute Myeloid Leukaemia, and his world is shattered with her passing. He finds it difficult to overcome his grief until a little cat called Coco enters his life. This is an emotional journey told by a compelling man. Michael Meyer's voice shines through and gives a very powerful message. I enjoyed the pacing and writing style and this novel really stuck with me long after I finished reading it. It was a witty and creative way to write about a non-fiction/memoir novel. There were deeper themes, but it was done in a way in which relating the experiences to food, it helped cut that and lighten it in a way. This book is a one all will enjoy, If you've known loss, found love, or laughed at a cat this is a story you will want to read. First off I normally do not read memoirs, but decided to take a chance on this. It was a surprising heartfelt read that explores the loss of a loved one to overcoming the heartache that is impossible to ignore, but with the help of three kitties that all changed. This book is a heartwarming read that gives you the lesson that there is a silver lining in life and to always look for the positive. I'm not a cat person since allergic, but after reading this made me think about getting one. Beautifully written and a very easy fast paced read that will give you the feels. This is a must read that will uplift your spirits. Loved it! Equally inspiring and entertaining, my story begins with loss and tears, but it ends with lots of love and laughter. I think that you will find yourself moved by my journey. THE THREE KITTIES THA Writer of mysteries, thrillers, humorous fiction, and non-fiction: Love and romance, laughter and tears, thrills and fears. All my books are available as both e-books and paperbacks at Amazon, and they are all part of the KindleUnlimited program. I thank you for your interest in my work.